Mitsubishi Outlander PHEV remains top selling electrified model, according to latest RAC Foundation figures, but ULEV sales continue to surprise with no clear trend. Despite Mitsubishi’s overall win in registrations over the past 12-months, the figures highlight the rapidly changing ULEV market, which is seeing cars like the Nissan Leaf (BEV) and BMW 330e (PHEV) almost match each other’s sales, with 4,859 compared to 4,850 respectively. And, although Nissan will understandably be proud of their all-electric Leaf’s UK best-selling electric vehicle status – Tesla has the second and third BEV slots with the Model S (2,310 sales) and Model X (1,686 sales). Additionally, the premium priced Tesla Model X sold more than the Volkswagen Golf GTE plug-in hybrid model and nearly twice as many units as the Renault Zoe, which sold just 985 in the past 12-months. The RAC Foundation’s figures also show that BMW’s i3 combined sales for range-extended and BEV variants total 3,148 sales, with the range extended version (REx) accounting for 2,356 of those. Furthermore, BMW’s i8 plug-in hybrid sports car that doesn’t even qualify for the government’s Plug-in Car Grant (PICG) has sold 273 units in the past 12-months, while Mercedes-Benz’s premium luxury limousine S500 Hybrid has witnessed a decline of -3 cars on the road – from 124 in Q3 2016 to 121 in Q3 2017. 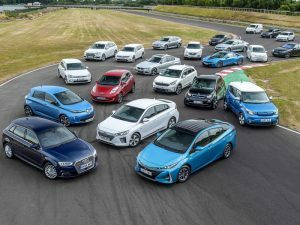 Yet more surprises come in the form of Toyota, which has managed to sell twice as many hydrogen fuel cell powered Mirai (29 sales) than Volkswagen’s battery electric E-up! supermini (15 sales).